“Caroline, look; this year’s festival t-shirts are made in El Salvador!” our chairperson proudly and enthusiastically announced, assuming I would be overjoyed. It was an attractive jerzees t-shirt. I feigned delight. My head was spinning. Certainly on the surface it appears we are supporting the economy of our Salvadoran friends. Yet, my memory returns to driving from the airport into San Salvador past those huge, long metal windowless warehouses I saw in the distance that stood out in the middle of fields under the relentless, beating sun. They were surrounded by tall metal fences topped by concertina wire. I discovered later what went on inside those monster buildings. 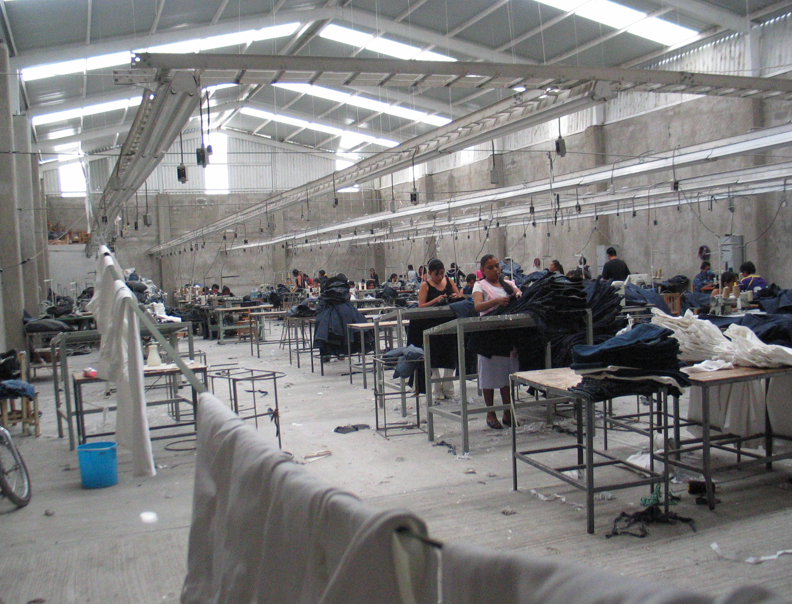 They are the dreaded maquiladoras/maquilas, commonly known as sweatshops. In these warehouses the workers are forced to work up to 21- hour days in over 90 degree heat without water or ventilation. Pay is pitiful. Their anti-labor foreign bosses violate their human rights and systematically fire anyone suspected of reporting them. 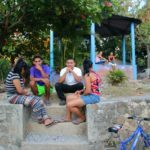 Salvadorans, just like other poor people in developing countries around the world, fall prey to foreign investors who take advantage of them in order to profit. 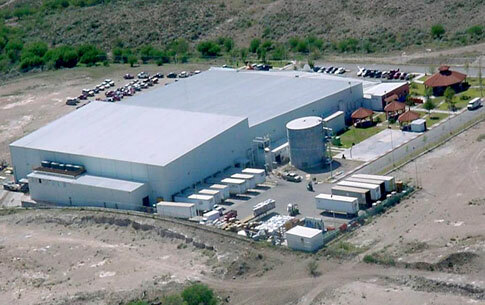 Maquiladoras manufacture in free trade zones by importing duty-free, tariff-free materials and then assembling, processing, or manufacturing them for export. In El Salvador 70% of that industry involves textiles. The majority of the workers are young, exploited women. Jerzees by Russell, GAP, Eddie Bauer, J.C. Penney, Dayton-Hudson, Walmart . . . All these companies use the maquiladoras in El Salvador. A friend in California who collaborates in ministry with us is firm in her commitment. “Personally I refuse to buy anything from Gap!” she announces, citing the mistreatment of Salvadoran employees in the maquiladoras in El Salvador. Salvadoran friends report that companies from places like Taiwan and Korea come into El Salvador without having to comply with its laws and habitually violate workers’ rights. When things heat up for them, the businesses will literally pack up their sewing machines in the middle of the night and move on to another country where jobs are just as scarce, where citizens are just as desperate to work, and where they can produce goods cheaper and with less hassle. There the exploiters begin the harsh treatment cycle all over again. On March 25, 2015, “Voices on the Border – – just and equitable development in El Salvador” (a group providing information and analysis on El Salvador) posted startling updated information on employers who are using gangs to intimidate, threaten, abuse, and kill their employees who join labor unions. Their purpose is to break up labor unions operating in the garment factories. LD El Salvador, a Korean textile maquiladora located in San Marcos is one example where employees are receiving phone calls to quit the union or risk “hanging from one of the trees outside the company.” 155 employees had belonged to the union. Since the threats began its membership has dropped to 60. Apparently, intimidation works. The Salvadoran worker faces a conundrum: to accept work in such horrid conditions or to support their families. Even though the perspective employees are aware of the working conditions and pay, the lines at the maquiladoras that are hiring on Monday mornings are long. The conundrum for people like me is how to support the Salvadorans whose human rights and dignity are continually violated. I would LIKE to wear that nice Jerzees festival t-shirt, but I wouldn’t feel right knowing the abusive situation under which it was made and realizing it financed investors half a world away from El Salvador. The sad reality is I probably have a closet full of other clothing items made under the same conditions that I am unaware of also.